It’s been a while since I prepared idlis using idli rava. 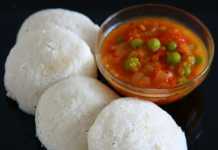 For those who are not aware of idli rava, it is finely cracked boiled rice. It’s available in almost all Indian grocery stores in Canada and USA. This idli rava with urad dal is used to prepare idli batter instead of the traditional method of soaking boiled rice, raw white rice, and urad dal. You still have to ferment the batter but it’s less work because you don’t have to grind the rice. 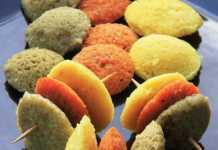 I have used this method to prepare the batter for these colorful cocktail idlis. This time I wanted to try cracked wheat instead of cracked rice. So I kept the other recipe as a base and substituted the idli rava with cracked wheat and added some poha (aval or flattened rice) to make the idlis softer and it worked indeed. The result was super soft and fluffy idlis. The idlis had a light brown color but the taste and texture were awesome. It tasted just like the usual idlis but even lighter. 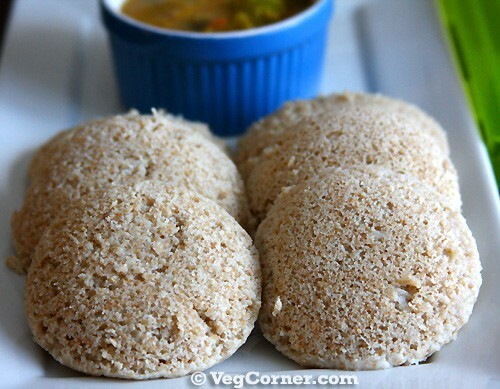 Check my notes for another super healthy variation of this recipe and prepare nutritious idlis regularly. Do you think preparing soft idlis is a cumbersome job? Not at all with this short-cut recipe. It’s easy to prepare, has a soft texture, tastes great and is healthy too. In a separate bowl soak the cracked wheat too. Do not use too much water for this. Use water just enough to moisten the cracked wheat thoroughly. The excess water if any will be absorbed by the cracked wheat. After 30 minutes, blend the urad dal, poha and fenugreek seeds in the wet grinder like you would do for regular idlis. Do not add too much water. The batter should be light and fluffy. Now while the wet grinder is on, mix in the soaked cracked wheat too alongwith the urad dal batter and let the grinder mix the ingrdients for another 3-5 minutes. Remove the vessel from the wet grinder; add the salt and sesame oil and mix the batter with your fingers thoroughly. Transfer the batter to a big container or 2 smaller bowls. The container should have enough space for the batter to rise after fermenting. Store the batter closed with a lid, preferably in a warm place for at least 12 hours (15 hours in colder countries). 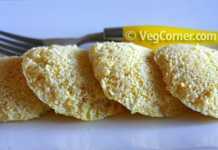 The following day prepare the idlis as you normally would or check this cornmeal idli recipe for further instructions. Two varieties of cracked wheat are available at the grocery stores; fine and coarse. I have tested this recipe using only the fine grind. But I’m sure the bigger variety should also work. You may have to grind it with the urad dal batter for about 7-8 minutes. These days I’m using fenugreek powder instead of seeds because sometimes the seeds are not ground completely. Using fenugreek powder is very convenient. Just add it with the urad dal and poha. I usually mix 1/2-1 tablespoon of sesame oil while mixing the salt (immediately after preparing the batter and before fermenting) because I feel that this yields softer idlis. I also tried another variation to this recipe by using 1 cup cracked wheat and 1 cup ragi flour. These idlis turned out even better. Soak the cracked wheat. Grind the urad dal and poha. Add the cracked wheat first and let the wet grinder run for 2 minutes and then slowly add the ragi flour too and grind it for another 3-5 minutes or until all ingredients are thoroughly mixed. Even my almost 2.5 year old son devoured these idlis with his favorite coconut chutney. I cannot vouch for the texture of the idlis if you use a mixie (Indian blender) for grinding the urad dal. Definitely use the wet grinder if you have one. Is it whole (round) urad dal or split urad dal ? Thanks. Found it in a sri lankan shop. Now I am going to make youe quinoa salad. Looks really pretty. 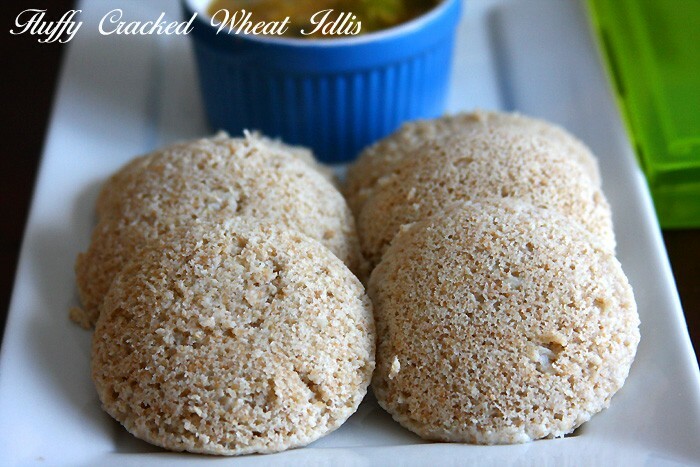 What is cracked wheat in tamil? Love this idea.Can you please tell me what I can substitute for the 1/2 cup poha? Thank you for sharing your wonderful culinary creations . You can use cooked white rice too.